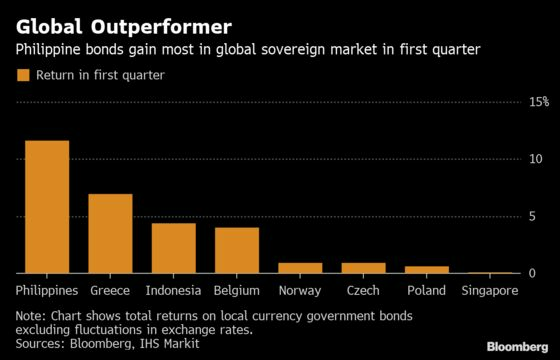 (Bloomberg) -- Philippine bonds were the world’s best-performers in the first quarter as slowing inflation fanned speculation the central bank has room to cut interest rates. The securities returned 11.7 percent over the three months, outperforming 34 other markets tracked by Bloomberg. Greece was second, gaining 7 percent, while the worst was Singapore, which handed investors a gain of just 0.1 percent. The “sharp deceleration in inflation” was among the major forces that drove Philippine yields lower, said Nicholas Mapa, a senior economist at ING Groep NV in Manila. “For the rest of the year, we expect rates to be pressured lower given our dovish outlook for both the BSP and Fed,” he said, referring to bond yields. The surprise appointment of Benjamin Diokno as Bangko Sentral ng Pilipinas governor in early March also helped bonds as it bolstered speculation the central bank will ease policy as the former budget chief is seen as favoring lower interest rates. The Philippine 10-year bond yield ended last quarter at 5.61 percent, having slid almost 3 percentage points from a high of 8.32 percent set in October. The peso was little changed in the first quarter, appreciating 0.2 percent.